(1) An applicant for an airman certificate, rating, or authorization under this part must make that application on a form and in a manner acceptable to the Administrator. (B) Knowledge test or practical test for an airman certificate or rating issued under this part, if the test is administered outside the United States. (ii) May be refused issuance of any U.S. airman certificate, rating, or authorization by the Administrator. (3) Except as provided in paragraph (a)(2)(ii) of this section, an applicant who satisfactorily accomplishes the training and certification requirements for the certificate, rating, or authorization sought is entitled to receive that airman certificate, rating, or authorization. (iii) Administrator determines that the applicant's inability to perform the particular area of operation will not adversely affect safety. (2) A limitation placed on a person's airman certificate may be removed, provided that person demonstrates for an examiner satisfactory proficiency in the area of operation appropriate to the airman certificate, rating, or authorization sought. (c) Additional requirements for Category II and Category III pilot authorizations. (1) A Category II or Category III pilot authorization is issued by a letter of authorization as part of an applicant's instrument rating or airline transport pilot certificate. (ii) For Category III operations, each initial limitation is specified in the authorization document. (i) In the case of Category II limitations, a limitation is removed when the holder shows that, since the beginning of the sixth preceding month, the holder has made three Category II ILS approaches with a 150-foot decision height to a landing under actual or simulated instrument conditions. (ii) In the case of Category III limitations, a limitation is removed as specified in the authorization. 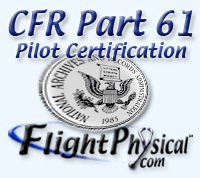 (4) To meet the experience requirements of paragraph (c)(3) of this section, and for the practical test required by this part for a Category II or a Category III pilot authorization, a flight simulator or flight training device may be used if it is approved by the Administrator for such use. (d) Application during suspension or revocation. (1) Unless otherwise authorized by the Administrator, a person whose pilot, flight instructor, or ground instructor certificate has been suspended may not apply for any certificate, rating, or authorization during the period of suspension. (2) Unless otherwise authorized by the Administrator, a person whose pilot, flight instructor, or ground instructor certificate has been revoked may not apply for any certificate, rating, or authorization for 1 year after the date of revocation.